How will rivals react to Apple's move into the streaming market? Apple’s announcement it is to enter the music streaming industry points towards the way we will access music in the years ahead. But how will it fill it fit into the sector, and what does it mean for those brands already occupying that space? Spotify is the major presence in the market at present. It has 20 million paying subscribers, as well as 55million users who stream songs free but have to listen to adverts intermittingly. Without doubt it has stolen a march on a potential rival. However, problems do exist. Arguments around royalties is one major issue. Artists such as Radiohead and Taylor Swift have removed their material from the service altogether. Rival service Tidal has been set-up by stars such as Jay-Z, Beyoncé and Kanye West in an attempt to combat this issue. 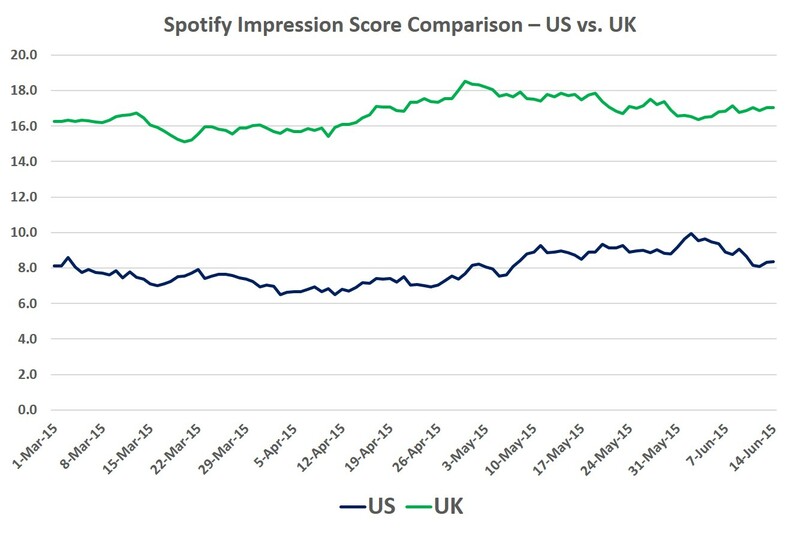 Our BrandIndex data currently shows a positive picture for Spotify. In the US, their Impression Metric score currently stands at around +9. In the UK, it is an even better picture, with the score showing a healthy +17. This indicates a brand in good health. Apple has also announced a 24 hour radio station which will complement the service. It includes presenters such as Zane Lowe – an ex-Radio 1 DJ. Radio 1 is a broadcaster that will also therefore be threatened by Apple’s move. Ratings are down for the station, particularly for the breakfast show. Company bosses are said to be content as it shows its focus on the 16-24 year old group is working. YouGov data reiterates this. 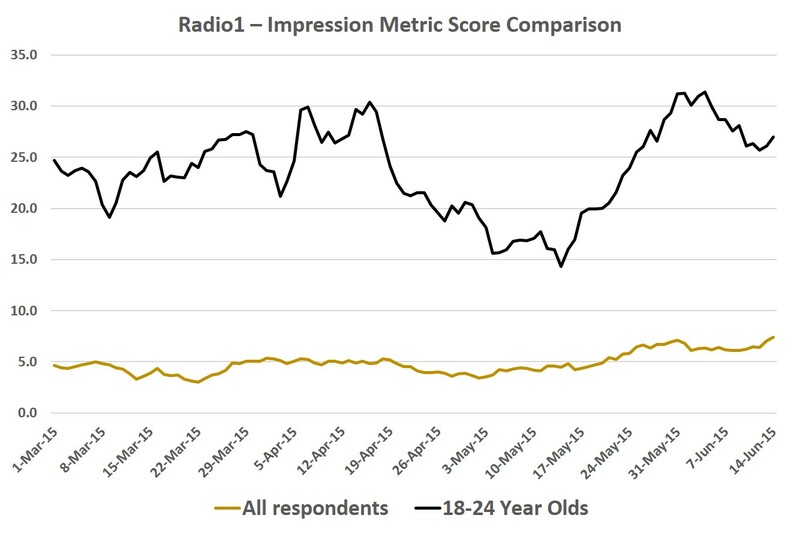 18-24 year olds have a far greater impression of the station (average of +24 since March) than the all respondents group (+5). They question is whether this group will move to Apple and leave Radio1 behind. Of course, the product offered may matter less than overall brand power. With basic similarities between providers (including price and song availability) Apple will be hoping customer loyalty and perception drives existing iTunes and iPhone users to the streaming platform, as well as convincing current rival subscribers to move.